The BiPAP Synchrony provides more natural and comfortable noninvasive ventilation specifically for COPD patients and others suffering from respiratory insufficiency. ALS or neuromuscular patients may also benefit from the therapy provided by Synchrony. Synchrony can be adapted to meet a patient's needs by offering flexibility in treatment options. The unit can be upgraded from Spontaneous Mode (S) to a version with Spontaneous/Timed Mode (S/T). 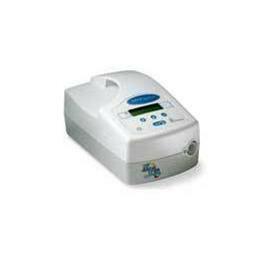 For greater flexibility, the unit has continuous positive airway pressure, Timed- and Pressure-Control Modes. Digital Auto-Trak Sensitivityâ„¢ has enhanced leak compensation to allow for better matching of the patient's breathing pattern. Vent Ramp and RiseTimeâ„¢ also aid in the delivery of comfortable ventilation. Features a broad pressure range of 4 to 30 cm H2O and the ability to collect patient therapy, compliance and machine data using an optional built-in modem.